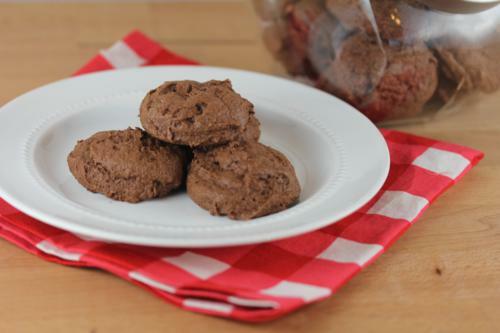 I know chocolate and sour cream together in a cookie may sound a little strange, but they make for a delicious combination in a gluten free cookie. When I saw the original recipe for these I knew I had to make a gluten free version because sour cream works so well in gluten free cooking. The sour cream makes these moist and delicious. They have a cake like texture that is light and fluffy and so good. 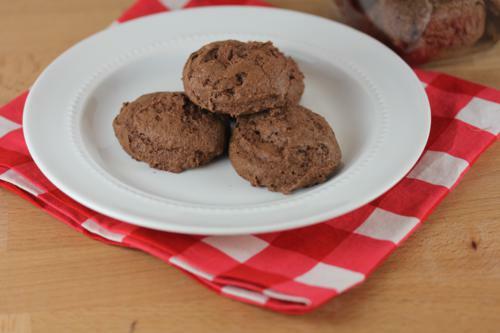 If you are looking for more gluten free cookies be sure to check out the other recipes in my gluten free cookies series. Melt chocolate and butter in microwave at 50 % power stirring every 30 seconds until smooth. In a bowl combine sour cream, oil, egg, and sugar. Beat until creamy. Add chocolate to sour cream mixture and mix until smooth. Add rice flour, sweet rice flour, cornstarch, xanthan gum, baking powder, and salt. Drop cookies by tablespoonfuls onto cookie sheet and bake for 7 minutes. Cool on cookie rack for about 5 minutes and continue cooling on wire rack.